National Hispanic Heritage Month is celebrated each year from September 15-October 15th. It was originally established, in 1969, as Hispanic Heritage Week, by President Lyndon Johnson. In 1988, it became a month long celebration. 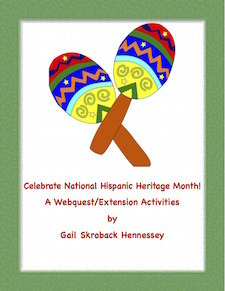 Learn some of the contributions made by Hispanic(and Latino )Americans, to our country, with this informative webquest! There are 12 web questions, a Did You Know? section, comprehension questions, a Teacher Page with extension activities and the key. Before colonists settled Plymouth Colony, there were people living in St. Augustine, Florida, and Sante Fe, New Mexico. Chinese(Mandarin)is spoken by the most people in the world. The second most spoken language is Spanish.A close third is English. The majority of Hispanic people in the United States came from the country of Mexico. Pedro Flores was the first to mass-produce the yo yo in the United States. 1. Which layer of the atmosphere was affected by chlorofluorocarbons? How is this layer important to us? 2. What is the term for the highest court in the United Sates? Who is the head of this court? Define and place in a sentence: census, architecture, condiment, customs, luminaries, pinata. Have students in small groups work on the web quest. Regroup and discuss the web quest. Have groups make 7 true or false questions to exchange with another group to answer as a review.